The Full Clip Basket is a long side basket that mounts between two vertical risers of theHalf and Full RAC Structure. They can be mounted at multipleheights along the inside or outside of the RAC Structure. The half clip basket can attach to the inside or the outside of the RTV RAC Structure. It’s perfect for quick grab and go tasks. Carries chainsaws, fuel, pruners, trimmers and more! Slide these large baskets along the RAC structure and secure them into place with innovative quick release bindings. 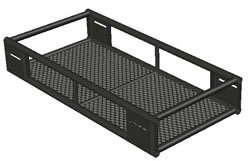 Or just position two baskets in the cargo box alone to instantly double your capacity while maintaining access to the floor. 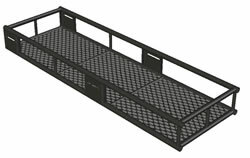 Two more baskets can attach to the Half RAC, and an additional 4 more to the Full RAC for a total basket capacity of up to 6 on a Full Rack. Multiple Baskets x Different Levels = Quadruple the Cargo Space!